A U.S. copy of the standard kilogram. Update 11/16/18: As expected, scientists have voted to dethrone le grand k in favor of measuring the kilogram based on the value of Planck’s constant. It’s sad to see the metal hunk go, though surely it’s for the best. The next question is whether we Americans will ever figure out the metric system. Read the story below for context. A long-discussed resolution for next week’s General Conference on Weights and Measures would toss out the international prototype of the kilogram—a hunk of platinum and iridium in Paris that everyone agrees weighs 1 kilogram. Instead, the International Bureau of Weights and Measures (BIPM) would redefine the International System of Units to ensure that kilograms are based on things that can’t change over time. It would require an entire rethinking of how kilograms work. As we’ve previously reported, there’s a reason scientists rely on a hunk of metal. King Louis XVI created a standardized weight to stop tradespeople from scamming customers, which was called the grave and was equal to a liter of water held at zero degrees Celsius. In 1795, French leaders decided instead to go with the gram, a cubic centimeter of water held at 4 degrees Celsius. The hunk of metal replaced the inconvenient water measurement in 1799, and 17 countries signed a treaty in 1875 to standardize their mass to the international prototype of the kilogram, or le grand k. Today, over a hundred countries, including the U.S., have signed an agreement to use the BIPM’s services. But even today, it’s all based on comparison. Le grand k remains secured under lock and key (three keys, actually) in Paris. Countries can get copies of le grand k, and then must use scales calibrated to the copy of the real thing. But it’s possible that something can get lost in the bucket brigade—and of course, there’s a chance the original goes missing or gets destroyed. 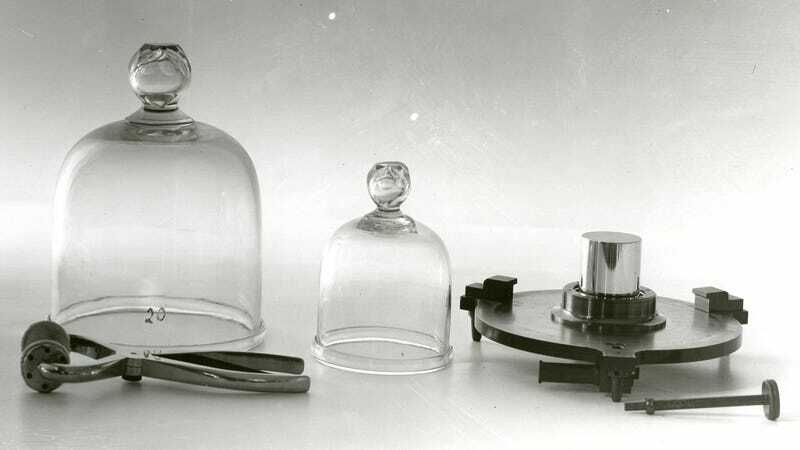 Comparisons with copies have also revealed that the mass of the kilogram (or the mass of the copies) has slightly changed, albeit an incredibly tiny amount. It’s possible the copies absorbed molecules from the air, or the original lost mass through washing or other physical processes, NPR once reported.